A tow-headed two-year-old boy got up this morning and packed away a heaping dish of corn flakes and milk with gusto, little the worse for a 30-foot plunge from his third-floor kitchen window last night. Richard Broderick, today had only a slight scratch on his right hip and a bit of soreness here and there to remind him of him stumble to the grass below. Richard was playing in the kitchen with his one-year-old sister, Dolores, while his father was watching television in the living room. The window was slightly open for ventilation and the boy apparently pushed it up and fell out. His father, heard the scream, dashed down the stairs and found Richard crawling toward him and crying a little. He was taken to the Hospital in a police cruiser. Examination showed no injuries. Mrs. Broderick, didn't hear about the mishap until she arrived home shortly before midnight. 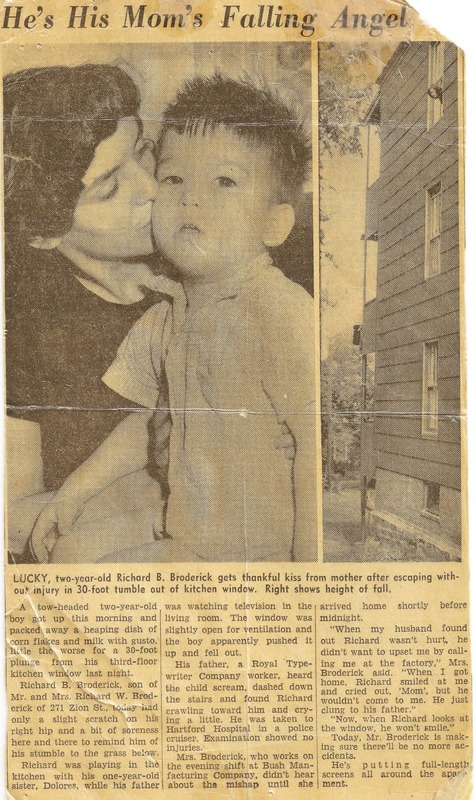 "When my husband found out Richard wasn't hurt, he didn't want to upset me by calling me at the factory." 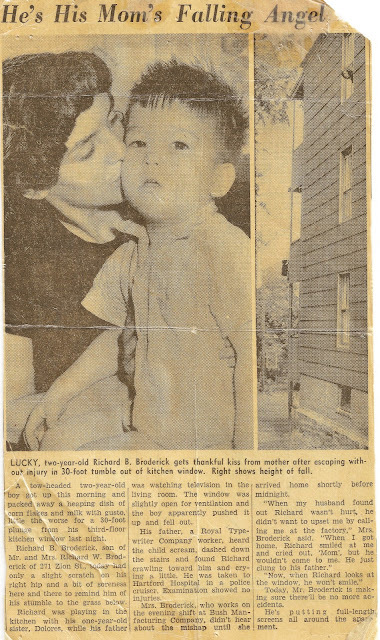 "When I got home, Richard smile at me and cried out, 'Mom', but he wouldn't come to me. He just clung to high father." "Now, when Richard looks at the window, he won't smile."